Intercultural communication is a form of communication that aims to share information across different cultures and social groups. It is used to describe the wide range of communication processes and problems that naturally appear within an organization or social context made up of individuals from different religious, social, ethnic, and educational backgrounds. Intercultural communication is sometimes used synonymously with cross-cultural communication. In this sense it seeks to understand how people from different countries and cultures act, communicate and perceive the world around them. Many people in intercultural business communication argue that culture determines how individuals encode messages, what medium they choose for transmitting them, and the way messages are interpreted. Cross-cultural business communication is very helpful in building cultural intelligence through coaching and training in cross-cultural communication, cross-cultural negotiation, multicultural conflict resolution, customer service, business and organizational communication. Cross-cultural understanding is not just for incoming expats. Cross-cultural understanding begins with those responsible for the project and reaches those delivering the service or content. The ability to communicate, negotiate and effectively work with people from other cultures is vital to international business. Attribution is the process in which people look for an explanation of another person's behavior. When someone does not understand another, he/she usually blames the confusion on the other's "stupidity, deceit, or craziness". Nonverbal communication is behavior that communicates without words—though it often may be accompanied by words. Minor variations in body language, speech rhythms, and punctuality often cause mistrust and misperception of the situation among cross-cultural parties. Object language or material culture refers to how we communicate through material artifacts—e.g., architecture, office design and furniture, clothing, cars, cosmetics, and time. In monochronic cultures, time is experienced linearly and as something to be spent, saved, made up, or wasted. Time orders life, and people tend to concentrate on one thing at a time. In polychronic cultures, people tolerate many things happening simultaneously and emphasize involvement with people. In these cultures, people may be highly distractible, focus on several things at once, and change plans often. This theory focuses on linguistic strategies to decrease or increase communicative distances. This theory is designed to explain how communicators adapt to each other in "purpose-related encounters", at which cultural factors need to be incorporated. According to intercultural adaptation theory communicative competence is a measure of adaptation which is equated with assimilation. As Gudykunst and Kim (2003) put it, "cross-cultural adaptation process involves a continuous interplay of decultruation and acculturation that brings about change in strangers [immigrant] in the direction of assimilation, the highest degree of adaptation theoretically conceivable" (p. 360). This approach was first theorized at the height of colonialism in Victorian England by Herbert Spencer who applied a notion of adaptation he borrowed from Francis Galton to social adjustment and efficient outcomes in wealth production. Communicative competence is defined as thinking, feeling, and pragmatically behaving in ways defined as appropriate by the dominant mainstream culture. Communication competence is an outcomes based measure conceptualized as functional/operational conformity to environmental criteria such as working conditions. Beyond this, adaptation means "the need to conform" (p. 373) to mainstream "objective reality" and "accepted modes of experience" (Gudykunst and Kim, 2003, p. 378). Adaptation theory advocates that immigrants and migrants "deculturize" and "unlearn" themselves and assimilate mainstream host cultural values, beliefs, goals, and modes of behavior so that they may become "fit to live with" (Gudykunst and Kim, 2003, p. 358). Adaptation is thus postulated as a zero-sum process where the minority person is conceptualized as something like a full finite container so that as some new goal or belief is added or learned something old must be "unlearned". Prominent current promoters of assimilation repeat Spencer's arguments stating that for the sake of the success of the mainstream culture ("effective progress") adaptation/assimilation must be in the direction of the dominant mainstream culture. While Spencer postulated mainstream culture as the dominant ways of thinking, feeling, and behaving, Gudykunst and Kim (2003) define the dominant group as a simple numerical majority ("differential size of the population" Gudykunst and Kim, 2003, p. 360). Any tendency by the newcomer to retain their original identity (language, religious faiths, ethnic associations including attention to "ethnic media", beliefs, ways of thinking, et cetera) is defined by Gudykunst and Kim (2003) as operational/functional unfitness (p. 376), mental illness (pp. 372–373, 376), and communication incompetence, dispositions linked by Spencer and Galton and later Gudykunst and Kim (2003), to inherent personality predispositions and traits such as being close-minded (p. 369), emotionally immature (p. 381), ethnocentric (p. 376), and lacking cognitive complexity (pp. 382, 383). Conformity pressure has been defined since W. E B. Dubois in 1902 as symbolic violence especially when a minority cannot conform even if they wish to due to inherent properties such as disabilities, race, gender, ethnicity, and so forth. Forced compliance/assimilation based on majority group coercion constitutes what Pierre Bourdieu writing in the 1960s and dealing with issues of intercultural communication and conflict called symbolic violence (in English, Bourdieu, P. (1977). Outline of a Theory of Practice. Cambridge and New York: Cambridge Univ Press). As Bourdieu (1977) maintains, the effect of symbolic violence such as host cultural coercion, the catalyst for "positive" cross-cultural adaptation according to Gudykunst and Kim (2003), results in the personal disintegration of the minority person's psyche. If the coercive power is great enough and the self-efficacy and self-esteem of the minority immigrant is destroyed, the effect leads to a mis-recognition of power relations situated in the social matrix of a given field. For example, in the process of reciprocal gift exchange in the Kabyle society of Algeria, where there is asymmetry in wealth between the two parties the better endowed giver "can impose a strict relation of hierarchy and debt upon the receiver." The model enables the research and monitoring on how intercultural interactions shift in time from "distance" to "closeness", or vice versa, from empathy to conflict, and from entropy to clarity, on which specific variables, and with which effects, in order to prepare specific interventions that reduce unwanted distances, conflict and miscommunications. Identifying hidden perceptions, roles, codes and values is substantial to determine the effectiveness of intercultural negotiations, and the outcome of intercultural key-leader engagement as in peacekeeping operations. The model has been used to analyze critical incidents in communication in intercultural crews in the International Space Station, and in the analysis of communication misunderstandings that generated deadly accidents, in the case of miscommunications in intercultural crews and communication deceptions of the Costa Concordia disaster. Context: A judgement that a person is competent is made in both a relational and situational context.This means that competence is not defined as a single attribute, meaning someone could be very strong in one section and only moderately good in another. Situationally speaking competence can be defined differently for different cultures. For example, eye contact shows competence in western cultures whereas, Asian cultures find too much eye contact disrespectful. Appropriateness: This means that your behaviours are acceptable and proper for the expectations of any given culture. Knowledge: This has to do with the vast information you have to have on the person's culture that you are interacting with. This is important so you can interpret meanings and understand culture-general and culture-specific knowledge. Motivations:This has to do with emotional associations as they communicate interculturally. Feelings which are your reactions to thoughts and experiences have to do with motivation. Intentions are thoughts that guide your choices, it is a goal or plan that directs your behaviour. These two things play a part in motivation. Empathy: Behaving in ways that shows you understand the world as others do. interaction management: A skill in which you regulate conversations. Tolerance for ambiguity: The ability to react to new situations with little discomfort. Interaction posture: Responding to others in descriptive, non-judgemental ways. Being aware of gestures that may be offensive or mean something different in a host culture rather than your own home culture. Engaging in divergent and systems-level thinking. In terms of intercultural communication there are language barriers which are effected by verbal forms of communication. In this instance there is opportunity for miscommunication between two or more parties. Other barriers that contribute to miscommunication would be the type of words chosen in conversation. do to different cultures there are different meaning in vocabulary chosen, this allows for a message between the sender and receiver to be misconstrued. When these actions are paired with verbal communication, a message is created and sent out. A form of nonverbal communication is kinesic behaviour. Kinesic behaviour is communication through body movement—e.g., posture, gestures, facial expressions and eye contact. The meaning of such behaviour varies across countries and affects intercultural communication. A form of kinesic nonverbal communication is eye contact and the use of the eyes to convey messages. Overall, nonverbal communication gives clues to what is being said verbally by physical portrayals. Nonverbal communication techniques used around the world and in multiple cultures. Nonverbal communication and kinesic is not the only way to communicate without words. Proxemics, a form of nonverbal communication, deals with the influence of proximity and space on communication. Another form of nonverbal behaviour and communication dealing with intercultural communication is paralanguage. Paralanguage refers to how something is said, rather than the content of what is said—e.g., rate of speech, tone and inflection of voice, other noises, laughing, yawning, and silence. Paralanguage will be later touched on in the verbal section of intercultural communication. 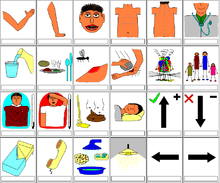 Nonverbal communication can be used without the use of verbal communication. This can be used as a coding system for people who do not use verbal behaviour to communicate in different cultures, where speaking is not allowed. An facial expression can give cues to another person and send a message, without using verbal communication. Something that usually goes unnoticed in cultures and communication is that clothing and the way people dress is used as a form of nonverbal communication. What a person wears can tell a lot about them. For example, whether someone is poor or rich, young or old or if they have specific cultures and beliefs can all be said through clothing and style. This is a form of nonverbal communication. Overall, nonverbal communication is a very important concept in intercultural communication. 1 2 Gudykunst, W. & Kim, Y. Y. (2003). Communicating with strangers: An approach to intercultural communication, 4th ed. New York: McGraw Hill. ↑ Bohman, J. 1999. 'Practical Reason and Cultural Constraint' in R. Shusterman (Ed.) Bourdieu: A Critical Reader, Oxford: Blackwell. ↑ Stene, Trine Marie; Trevisani, Daniele; Danielsen, Brit-Eli (Dec 16, 2015). "Preparing for the unexpected.". European Space Agency (ESA) Moon 2020-2030 Conference Proceedings. doi:10.13140/RG.2.1.4260.9529. ↑ Akmajian Adrian, Demers Richard, Farmer Ann, Harnish Robert. 2001. Linguistics An Introduction to Language and Communication. 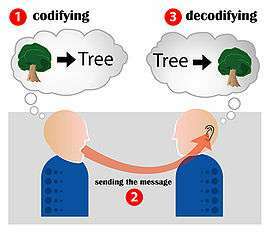 Communication and Cognitive Science. pp.355. ↑ Morgan Carol, Byram Michael. 1994. Teaching and Learning Language and Culture. Culture in Language Learning. pp.5.